At our latest installment of Supper Club, us ladies sat around the table laughing, talking and sharing life. This once-a-month gathering is one of those times you want to slow time down and savor it. We marveled at how much childhood has changed from when we were kids until now over Korean barbeque and coffee. We discussed how our mothers had only the temptation to keep with the Jones' (if they were in fact next door) rather than hundreds of Jones' on newsfeeds. We laughed about how we've all seen pictures of our Facebook friend with clean and perfectly coifed hair with smiling children on her third outing of the week, while we feel worse about sitting at home still in pajamas with unbrushed teeth and no plans, and it's not Saturday. C.S. Lewis said, "Friendship is born at that moment when one person says to another: What? You too? I thought I was the only one." The next comment caught me off guard: Isn't it crazy how you can feel so lonely when you are so connected? All of us are connected to each other and to many others, yet it was unanimous– a lot of life can be be lived lonely. If we, these "connected" women feel lonely, I wonder about the woman who just moved to a new town, or the one whose friends have moved away, or the one with the unpredictable work schedule, or the busy mom who doesn't get much adult conversation... is she craving connection? 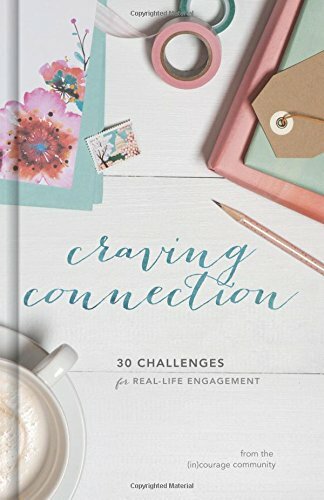 In the midst of our super "connected" world, this title grabbed me: Craving Connection. Our obsession with celebrities and social media proves that we all want to be connected but I'm convinced it's not what our souls really long for. Because we want to be truly known and really loved. Do you know you are known by God? Truly known and perfectly loved. In this book are 30 challenges for real-life engagement written by multiple authors from the (in)courage community (a ministry of DaySpring... who knew they have more than greeting cards). Craving Connection will help you foster deeper connections with God, more purposeful connections with friends, and more intentional connections with your community. Recently I was asked how to get to more "real" conversations. My reply was, be wiling to go first. Connection begins with a brave admission of imperfection and deepens the moment someone says, What? You too? I thought I was the only one. "Your gift– no matter how big or small it seems to you– is so important. We need you! We–the Church, the body, your community– need the you that is unique and valuable and crucial to finishing our puzzle. We need your faith and your prayer and your service and your preaching and your guitar-playing and your muffin-making. We need your leadership and responsibility and motivational speaking and encouraging writing and compassionate listening. We need exactly what God has given you, and you need what He's given me, too." "In our busy world the question naturally becomes, 'Why bother coming together?' We've been taught to look out for number one, to pull ourselves up by our bootstraps, and that we can be anything we want to be.... all by ourselves. And relationships are messy. They're complicated. At times they're downright painful. It seems like the risk could outweigh the reward... True connections take time, committment, and courage. While social media can make it seem like bonding is as easy as clicking a 'like' button, we're called to go deeper with each other. And that means making relationships a priority Our season of life and circumstances will impact our capacity for connection, but we can all pause and ask, 'What can I do to truly connect with the people I love?' Even a little bit of time or encouragement can make a big difference." Since B&H Publishing gave me a free copy of Craving Connection in exchange for my honest opinion, my honest opinion is this would make a great summer book club. We all love summer but know it can be a time when the lack of routine can limit connection. So, be brave and go first with depth, purpose and intentionality.